Did you know that 9 out of 10 bottles of wine are consumed within days of purchase? However, some wines become more desirable with age and therefore require the proper care, storage and environment to develop. A wine rack holder is the best solution. We have searched high and low to find the best wine racks for vintage wines. Vintage View wine racks showcase your vintage wines like no other. They are one of the best wine rack designs for attractively displaying your beloved vintage wine collection. You can make any wall in your house or restaurant outstanding with this innovative wine rack! The high-quality steel frame is built to last and is extremely easy to install (only 3 screws to each strip). 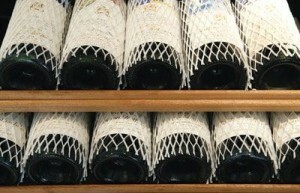 Wine is prevented from spoiling with each bottle horizontally placed; this keeps corks moist at all times. Your vintage wines are stored securely with Vintage View wine racks. Vintage View wine racks are available in a variety of sizes from 9 to 37 bottle capacity. Browse the collection here. Big Metal Wine Racks offer a different wine rack appearance than that of Vintage View. The solid metal design is sturdy and reliable while also flexible and suitable for nearly all bottle types. These wine rack designs give a contemporary and almost industrial feel to any wine cellar or wine room. Vintage wines are stored perfectly with Big Metal Wine Racks as the sleek metal material stops wine bottle labels from snagging. Any wine collector or expert will know just how important this is for your vintage wine bottles. Big Metal Wine Racks are available in a variety of sizes from 12 to 72 bottle capacity. Browse the collection here. Oak wine racks are one of the best storage solutions for vintage wines. The oak material stops labels from snagging which is extremely important with prized vintage wines. An oak wine rack is a great feature in any room or space and draws attention to your unique wine collection. The oak wine rack is hand crafted in beautiful solid oak and tailored to your specific requirements. As shown in the pictures above, the wine racks can include a number of combinations including individual bottle racks, wine cubes with diagonal dividers and case racks with sliding shelves (easy to remove wine bottles). All of the oak wine racks are sealed with a Danish Oil Finish which emphasises the beautiful grain in the wood. Plinths and tops are available; plinths prevent the lower bottles from being knocked over while oak tops give your wine rack a finished look. We are more than happy to discuss your wine rack plan and will also offer our thoughts, experience and recommendations if need be. We can design wine rack solutions (single racks, complete cellars, bottle racking, case storage etc.) for almost any space and have previously installed these in private homes, hotels, restaurants and commercial establishments. Please take a look at our Oak Wine Racks page. Or alternatively contact us today to discuss your wine rack requirements. Wineware’s Top Tip for Vintage Wine! Use cellar sleeves to protect your vintage wines. These sleeves can keep wine bottles completely protected, free from dust and free from spillage/stains if another bottle is broken. They keep your vintage wine in pristine condition all year long (or for years). Cellar sleeves are 100% reusable and you can buy them here. Wine Bottle Protector Sleeves can also be used to protect your wine bottle labels from snagging. These can be used with wine bottles on a wine rack or for protection during transport. They are a cost-effective and worthwhile investment for looking after your vintage wines. Protector sleeves offer the best protection. Remember! If you look after your vintage wines, your vintage wines will look after you. If you require any further assistance on wine racks for vintage wines or any other queries, please call us on 01903 786148 or fill in our online enquiry form and we promise to get back to you as soon as possible.